She is a warm, caring and amiable teacher. Her experience from teaching dancing lets her be able to clearly describe every position to her student. With many years of dancing experience, she is able to infuse dancing elements into yoga - Yoga Dance. She delights to share her knowledge with all her students. 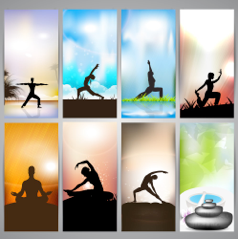 As a yoga teacher, she emphasizes step-by-step, safe and correct training methods. “Yoga is not just about poses or positioning, every movement comes from within the heart, yoga is a way of life”. In 2009, she completed 200 hours of Yoga Alliance Teacher Training and 120 hours of Hot Yoga Teacher Training. Thereafter, she started to teach various yoga courses and also became an Assistant Teacher for Teacher Training course and through this, she has gained invaluable yoga teaching experiences. Irina has always tried to live a balanced life. She strongly believes that a fit body and a peaceful mind allow you to get the most out of life. She first discovered yoga 8 years ago in the university. She then realized that yoga not only helped her to open up her body but most importantly her mind. After two years of practice, she got a yoga teacher certificate and has taught in different studios and gyms since then. She went to Bangalore in India to further improve her knowledge in 2009 and started to work in Singapore. She got a certificate of fitness as well, because she believes if you want to have a peaceful mind you should know have a good physical condition first. She attended different workshops and got a hot yoga certificate in 2011. With her knowledge and years of experience, she will help you to discover your body and get the best out of yourself through yoga. Her first yoga class was a wonderful experience practicing the Asana in 2006, which brought her much joy and fun. What started out as a simple and relaxing exercise soon grew to a burning passion, after experiencing first-hand the many health benefits that yoga brings. Cindy the progressed from a student and completed 250 hours of Teacher Training course in Singapore, pursuing and achieving a First Class Distinction in Diploma in Yoga Education - D.Y. Ed. from Yoga University - Yoga Vidya Gurukul, India. For Cindy, Yoga is part of a healthy lifestyle and helps one to be calm thus improving personal relationships. It provides an emotional lift and creates a joyful and harmonious mood. She aims to share and discover with her students the joy of yoga, as well as its benefits to both physical and mental well-being. Eric facilitates and teaches passive and active forms of yoga depending on the body's current condition, tailor-fitting it to his clients. His peaceful but cheerful personality adds zest to his yoga teaching. He is also a Reiki Practitioner and integrates this discipline on his hands-on adjustment for a therapeutic and healing yogic experience. He believes that yoga is a tool of observation to explore the breath-body-mind psyche and should be available to everyone. It does not discriminate and surpasses any gender, color and race. It should be open to anyone who is willing to learn, explore and have fun. His connection to his physical practice allows him to discover and explore on ways to teaching mindfully. He adores teaching Hatha, Ashtanga, Yin, Vinyasa, Prenatal and Restorative classes amongst many. Moon Lee first started in contact with Yoga when she travel to Osaka, Japan in 2009. She immediately felt the mental and physical benefits through various asana practices. This wonderful yoga experience inspires her to take up yoga class once back to her home country. Since then, she enjoyed yoga so much that she decided to practice and study yoga full time in 2010. Throughout the year, she had been travel extensively to attend classes and workshops in multiple countries (Singapore, Malaysia, India, Taiwan, Indonesia, Thailand, Japan and Korea). She also has exposure with a variety of styles including Hatha, Anusara, Yin and Iyenga. In 2010, she is blessed to further her yoga study in India and completed her 200hrs Yoga Teacher Training course at Yoga Vidya Gurukul, Nasik, India. Moon specializes in teaching beginners. She firmly stress on correct alignment for yoga poses to obtain maximum benefit from the poses and prevent injury. Acquainted with yoga as a fitness regime in 2007, Amanda realized over time that the yogic practice brought about greater transformation from within. Experiencing the therapeutic qualities and life-changing essence of yoga ignited Amanda’s vision to become a yoga teacher to bless others. In May 2012, Amanda became a 200-Hour Yoga Alliance certified teacher at Vikasa Yoga, Koh Samui Thailand. She also specializes in Children’s Yoga (95-hour Yoga Alliance Certification with Global Family Yoga) and currently furthering her yoga studies, Diploma in Yoga Therapy(S-VYASA University) training at Vyasa Yoga Singapore. Her teaching is influenced by styles of Hatha and Vinyasa flow yoga. Amanda embraces the affinity of music and yoga by using music and metronome in her classes. They facilitate rhythm, breath, movement, flow, harmony and sequence, reflecting the equilibrium of the body, mind, soul and spirit. Amanda continuously encourage students to find their inner bliss, strength and love through the rhythm and flow of her class, that they may take it off the mat and enrich their daily lives. Lydia's yoga journey was one of humble origins. Yoga was not Lydia's usual fare when she attended her first class in 2006. She had always been a cardio junkie, preferring fast-paced heart-pumping classes for a good workout. Naturally, she did not fall in love with it immediately. She actually found it quite a challenge to even hold the asanas. However, she did not give up. She continued taking classes as a challenge to herself. As time went by, she was drawn in by a strange curiosity about how yoga made her feel different in a good way. Slowly, she began finding fulfillment in her practice and yoga became an integral part of her life. Lydia soon felt that it was time to take her practice to next level. By the time she completed her 200 hours Yoga Alliance Teacher Training at Dr. Venky's Shivshakti Yoga Institute (International) India in 2012, she had discovered a new love - that for teaching and sharing the joy of yoga with others. Dawn's first yoga class was a memorable 90 minutes hot class. She spent half the time running in and out of the studio to escape the heat and gulp down water! Despite the demoralizing experience, the feel-good effects after the class prompted her to keep coming back to the mat. Having practiced for more than 4 years and ventured into different styles of yoga, she loves that there are always new poses and variations to learn. The learning journey never ends and yoga never gets boring! Other than the physical benefits she experienced, being on the mat after a long day at work has also become her quick-fix for stress relief. Inspired by fellow passionate yogis from all walks of life and the amazing benefits it has brought to them and herself, Dawn decided to take up a 200Hr Yoga Alliance teacher training course in March 2013 so that she can share this wonderful experience with others. Dawn believes it is most important to have a fun and safe practice, and encourages students not to be too hard on themselves on the mat. Her teaching emphasizes on proper alignment to build a strong foundation. She feels extremely blessed to have found yoga which she truly enjoys, and to have the opportunity to share it with others. Soo Chee started developing an interest for Yoga back in 2003 when she first started out her regular gym routine. Inspired then by her teacher, she decided to embark on her spiritual journey by taking up a one month residential teacher training course at Yoga Vidal Dham, Nashik, India. Through the course, she began to deepen her practice and passion for yoga. Ever since then, yoga has become a great part of life for Soo Chee. To her, yoga does not only start on the mat but it also starts off the mat. The most rewarding part for her is to be able to share her knowledge of yoga and to help students to develop inner peace and awareness in their lives. Jean started Yoga since 2011, Yoga has transformed her life and it soon became apparent that she wants to help spread the love so others could benefit and enjoy having greater balance and happiness in life. She received her Beginner’s Hot Yoga Teacher Training 200 RYT with Pure Yoga in 2012, and graduated with a Diploma in Yoga Education after a month residential Teacher Training Program with Yoga Vidya Gurukul in Nasik, Mumbai, India in 2013. Teaching Yoga has ripened her practice and refined her life. She’s inspired by her students and the courage her foster within herself and others.